I was sitting on a couch in a comfortable and decadent penthouse-style apartment overlooking a beautiful city landscape at night time. The horizon was peppered with lights and buildings in the distance. In front of me was a floating flatscreen monitor, hovering at an angle below my neck, in the perfect spot for me to look down at the screen and still see in front of me. While reading over BigScreen’s options menu, I clicked a button and suddenly my desktop was projected onto a 16-foot tall giant display on the wall. Note: Images in this post were not taken while I was in BigScreen, but I saw the functionality to support what’s shown. To my left, talking about his vision for this desktop interface of the future, sat Darshan Shankar. Well, a disembodied head that represented him floated next to me at least. An important distinction to make is that they’re not just bringing a web page or a collection of apps into a VR environment, you’re accessing the entirety of your computer. That means any web page can be pulled up at any time, any program can be launched, and literally anything that would appear on your monitor outside of your HMD can be seen and shared inside the virtual environment. In AltSpaceVR, you can pull up web pages like YouTube to share with people, but it’s very limited in scope. With Oculus Social in its current state, you can watch Vimeo, Twitch, and do some basic trivia games, but only what’s predetermined as part of the social app itself. Those types of programs have different and much more restrained scopes. By comparison, BigScreen is limitless. During my alpha demo, the biggest thing that stood out to me was just how seamless and polished it already was. I didn’t get disconnected nor did I notice much lag. Everything I wanted to do worked. Shankar said any delay I did perceive might have more to do with a shaky Internet connection than anything else. Audio was crystal clear, his floating head was emotive and accurately portrayed, and the screens could be easily and effortlessly shared on the giant wall-sized monitor at the click of a button. Shankar was previously the CEO and co-founder of an enterprise software startup building developer tools that was funded by Y Combinator, Andreessen Horowitz, Salesforce, and more. The other half of BigScreen is Hayden Lee. Lee was previously a co-founder of Convrge, which was a social VR app that ceased active development recently. Shankar said Lee joined BigScreen earlier this year. Shankar said BigScreen is receiving funding from “Tier 1 Silicon Valley Venture Capitalists,” but wouldn’t reveal specific details on their seed round yet. He also told me that he’s been working on the program since Dec. 2014. and it’s been in private beta since July 2015. It’s taken that long because it’s incredibly complex. The best way to describe BigScreen is to call it both versatile and infinite. You can easily share your desktop while sitting side-by-side with a friend in a virtual space. That means you could both hang out while working or answering emails, or doing anything else you might do when meeting a friend at a library or coffee shop. But then you could also project your screen onto the wall and watch a movie together. Or a YouTube video. Or open up HBO, or Crunchyroll, or literally any streaming site you wanted. You could even launch videos you have saved on your hard drive – it doesn’t matter. Then even beyond that, you can play games together in VR. While sitting together on the couch, you can have a virtual LAN party and boot up your favorite MOBA or any other multiplayer game. Or you could even be collaborative and work together on a project in Unity or do some 3D modeling in Maya. It seems silly to list out all of those mundane everyday things like that, but that’s the best way to describe it. Everyone knows you can screenshare over Skype or play games on Steam with friends, but you don’t feel like you’re actually together. BigScreen combines the power and utility of your desktop computer, with the limitless and immersive presence of VR, to create a one-of-a-kind social experience with just as many possibilities as the real world. “We allow you to experience, literally, the entire world of digital content in BigScreen, in VR, with your friends,” Shankar said. BigScreen marks a significant shift for VR tech. Previously, VR was always seen as an isolating experience with singular purposes. Even social apps were limited by what the designers thought made sense for the environment you were experiencing virtually. 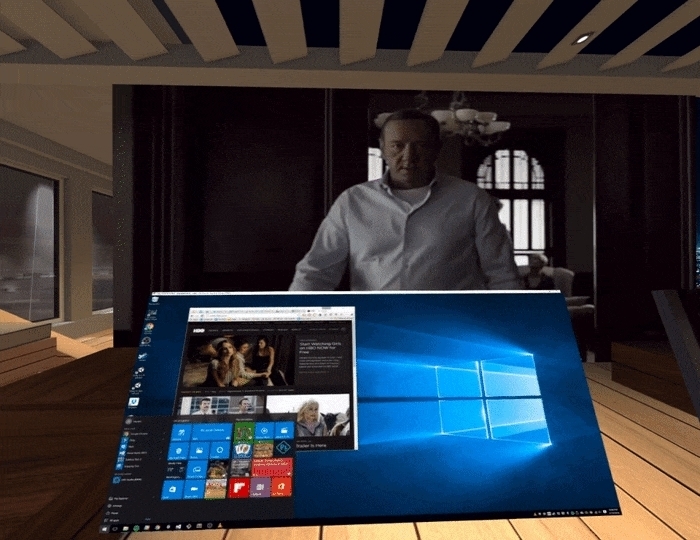 But now anything that your PC can do, you can do in VR, in a shared space, with other people in real-time. VR technology is on the verge of mass availability. With its adoption will come not only a revolution for video games, but a revolution for how we communicate and collaborate together. And soon after that in a few more years down the road, AR will start to change our lives as well. Companies like BigScreen are building for the future by solving problems today. BigScreen is now accepting public beta registration on their website and you can follow them on Twitter to stay up-to-date. They’re targeting a full, public launch on the Oculus Rift and HTC Vive in April 2016, with Samsung Gear VR support to come later this year.